Kazan Cathedral, Nevsky prospect, Griboedova Channel and House of Books are in several minutes walk from apartment. 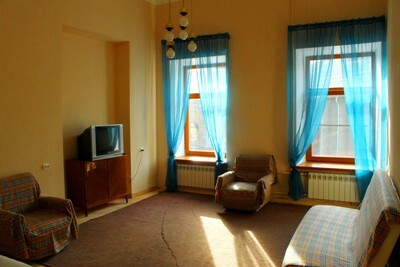 This is wonderful species standart 2 room apartment on the Griboedova channel, 20. All 3 windows overlook on Kazan Cathedral, Nevsky prospect, Griboedova Channel and House of Books. There are 2 double sofa beds and 2 armchairs. In the bedroom you can see one more double sofa bed. Apartment accomodates up to 6 people (2+2+2). Flat is equipped with all necessary facilities for comfortable living: 2 Tv, microwave oven, coffee machine, electric kettle, refrigerator, internet, tableware, bed linen. Apartments is located on the 3d floor without lift. There is safety entrance from the street and from the yard. There are a lot of shops, galleries and museums around the apartment.